Ped·es·tal : A piece of furniture which fits under a desk and is used for storage. I found the above definition of the pedestal in an internet dictionary. Quite a boring description that does not embody all the things about this exquisite furniture item. Originally drawer pedestals were fixed upon freestanding desks, but the box/box/file and file/file pedestals were able to declare their independence upon the arrival of systems furniture in the late 70’s and early 1980’s. No longer part of a desk they became independent components and have evolved into a multi-functional piece of furniture that can complete any space. The box/box/file or B/B/F is the most problematic of the two pedestals. The file/file pedestal seems to always live up to it’s description. However, the 6” storage drawers lend themselves to much abuse. They seem to fall into fate of being junk collectors. We all start out with good intentions but eventually our pens, paper clips, yellow highlighters and anything else that will fit (a pair of socks?) get stuffed into these storage drawers. This in turn can lend to the abuse of the file drawer that now is the storage devise for a pair of shoes, a purse or lunch box. 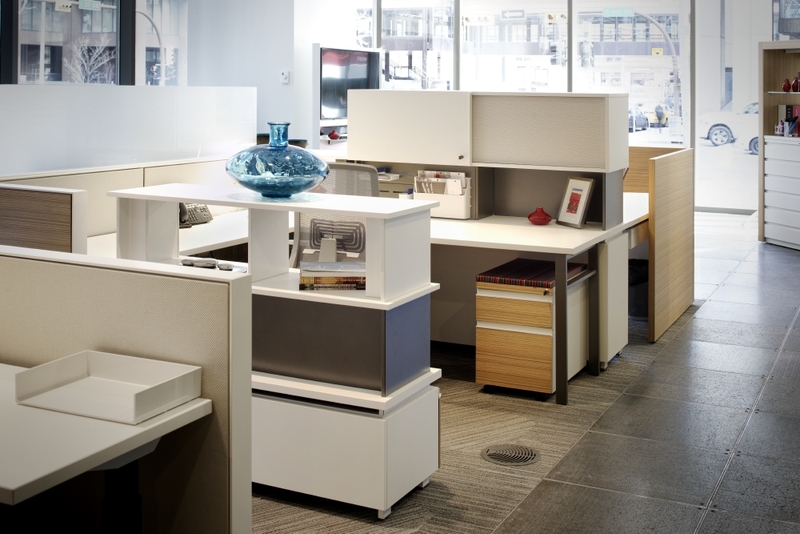 Fortunately, Haworth offers the X-Series line of drawer pedestals that are unsurpassed in physical appearance, strength and security. The pedestals offer eight (8) different drawer pulls along with a long list of finishes that can mask whatever we choose to use them for. The pedestals are available for an 18”, 24” or 30” deep units. They also offer accessories to help keep everything organized and everything you need within arm’s reach. In a world where collaboration is everything, yet the average workstation is less than 50 square feet, seating is a premium that many workstations don’t afford. The X-Series Mobile Pedestal with a custom cushion top allows for convenient collaborative seating when you need it most without taking up precious space. If you're feeling an attraction to the X-Series, give us a call and we'd be happy to help!